Lock in a great price for Roy's Rendezvous Boracay – rated 8.5 by recent guests! Great locations. Staff are friendly and cooperative. Gil, Mark and the women were great and easy to communicate with during my stay. They went out of their way to make sure I had a good visit to Boracay. 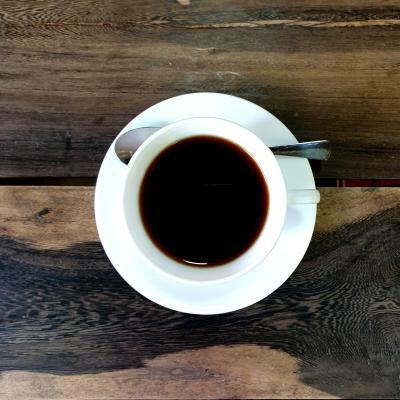 The breakfast in the morning was delicious and I loved that I could have more than one cup of coffee. The hammocks in the center are very relaxing to come back from the beach and hangout drinking a beer. Our stay here was awesome! We liked the homey atmosphere and the personal touch the staff provided during our stay. Everyone was very kind and helpful. They also serve lunch if you ask one day in advance and the dishes are real Filipino food with great flavors. We enjoyed lunch here almost every day. It's charming, quiet, and nostalgic of the Boracay from decades past. The garden is very beautiful. And the hammock in the front of the room is very nice. 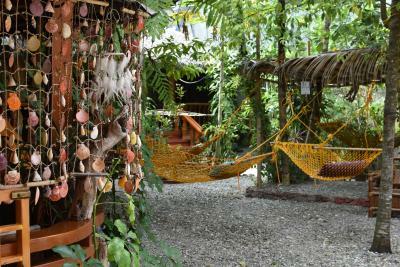 We chose it coz of the nice garden and hammock. The staffs there are friendly. And they have a lovely dog called lemon. The property is in the station 3, 2mins walk to the white beach, 10mins walk to dmall. Everything is reachable, and convenient. Good location next to the beach, clean rooms, quiet and can arrive by walk to the bars and restaurants. The staff in the guesthouse are so nice and kindly . We had a great time in roy’s rendezvous. Friendly staff , the place is very comfortable peace & quite. The staff was very friendly and helpful with giving suggestions of what to see on the island and what beaches were the best. We should have asked more questions. Roy's Rendezvous Boracay This rating is a reflection of how the property compares to the industry standard when it comes to price, facilities and services available. It's based on a self-evaluation by the property. Use this rating to help choose your stay! The air-conditioned rooms are equipped with cable TV and have a private bathroom with hot and cold shower facilities. All rooms have a private balcony while some rooms also provide a hammock. Guests can rent a bicycle to explore the surrounding island. Alternatively, the hotel has a tour desk which organizes excursions to nearby attractions. Nestled within tropical greenery, The Roy's Boracay Hotel is a 20-minute walk from D'Mall and about 15 minutes by bicycle from the famous Willy's Rock. 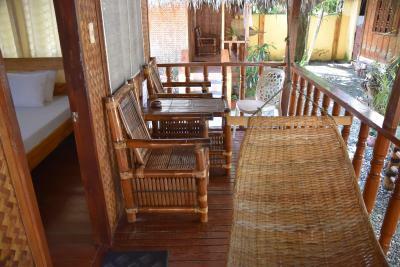 뀐 Located in the top-rated area in Boracay, this property has an excellent location score of 8.4! When would you like to stay at Roy's Rendezvous Boracay? 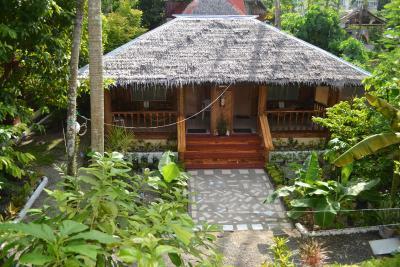 Stand-alone and air-conditioned bungalow for 2 features a private balcony and a hammock. Room for 4 comes with air conditioning. They are all equipped with cable TV and have private bathrooms with hot and cold shower facilities. All rooms have a private balcony. This twin room comes with air conditioning and a private balcony. It is equipped with cable TV and a private bathroom with hot and cold shower facilities. This standalone duplex bungalow with 2 separate rooms features air conditioning and a private balcony with hammock. It is equipped with cable TV. Each room has a private bathroom with hot and cold shower facilities. 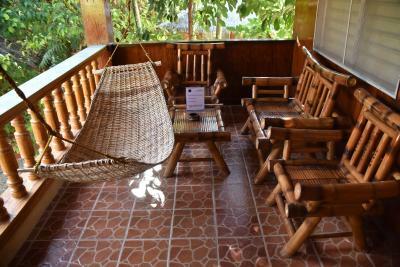 This corner double room on the second floor has a balcony with a hammock and garden view. It comes with air-conditioning and is equipped with cable TV. Private bathroom is fitted with hot and cold shower facilities. House Rules Roy's Rendezvous Boracay takes special requests – add in the next step! Please note that construction is currently taking place nearby. Guests may experience light disturbances. Please inform Roy's Rendezvous Boracay of your expected arrival time in advance. You can use the Special Requests box when booking, or contact the property directly using the contact details in your confirmation. A bit hard to find and have to walk quite a bit to reach it from the main road. 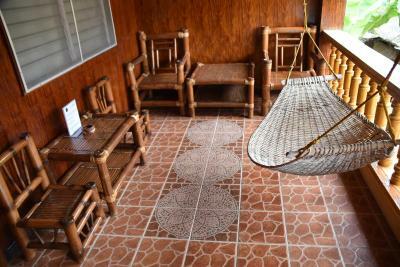 a mere 200 meters away from the seashore, however, far enough from the main thoroughfare that you can get a relaxing, quiet rest when you need to. Perfect for the family. A bit of a walk from the drop off point as the vans can't drive there so getting to and from the ferry takes a bit. After that the beach is 2 minutes away. Very quiet and private but only a two minute walk to the beach. I had a big suitcase and it was difficult to get to the hotel because there is no access for transport. Clean quiet place. Friendly staff. Inaccessible to the vehicle, but at Station 3, almost every accomodation is like that. You have to walk with the luggage from the road to accomodation. Great balcony with hammock, very clean room, white sheets and towels, comfortable bed, nice and clean garden, quiet neighborhood. Breakfast was OK, stuff very kind, polite and proffesional. Great place to stay in Boracay if you want avoid paying expensive Hotels and resorts. 1. The room itself was very basic, with a very small bathroom. There were no toiletries provided. 2. The room is quite a place for lizards and bugs and there were ants crawling over the bed continuously. There was no mosquito net which should be made a necessity there. 1. The room itself is in a sort of hut (which houses two such rooms separated by a door) and has its own porch area. There is a hammock and a eating area with two chairs. 2. The breakfast was served in the private eating area which made the experience more personal. 3. The breakfast was quite good. The omelette was the best I have tasted in a very long time! 4. The staff is quite friendly and polite. 5. The place is located quite near to the beach, however there are two sides to enter, one from the main road and the other via the beach. We took the path shown on the offline map and it was quite a tedious road. I would suggest to take the beachfront path. The quality of breakfast was not very stable. The two things that I did not like was that WiFi was not available all over the property and that they did not have bikes to use and both these were stated in the write up of the property, so if you have read that and my review, contact Gil and ask about the WiFi. Bed is a little small for two people but comfortable. Had water heater but didn’t work much. Very clean. Brilliant and very friendly staff that will go the extra mile for you. Quick laundry service. Room is quite basic but spacious and also has nice private balcony, each with a hammock. GOOD WATER PRESSURE!!! Not much, just there are no signs along the beach to point to the resort. Facilities and the place is good. Very nice location 3minutes walk to the beach,close to restaurants and bars,very nice staff,very clean.